I bought this purely for the Meg Cabot story – as anyone who knows me will testify I am completely addicted to Meg Cabot books – I just love them. This short story, called The Exterminator's Daughter, is no exception and was (for me) worth the price of the book alone – I would really like to see it become a series! 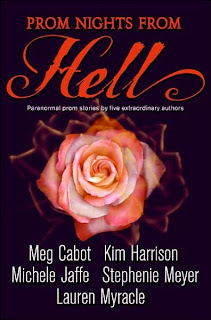 The other stories that stood out for me were Kim Harrison’s Madison Avery and the Dim Reaper - which I was please to see had become a series - and Stephenie Meyer's Hell on Earth. I enjoyed this – I don’t often read short stories but these were long enough to feel like a complete story, with the added bonus I could read the whole story in my lunch break. It was also a great introduction to authors I hadn’t read before - I’ve also got Love is Hell and Vacations from Hell which I look forward to reading. I love Meg Cabot too so I think I'll check this out! Thanks for the great review!